Unfortunately, being tall in the world of stand up desks is not great! Standing desks for a tall person aren’t easy to find: almost all will accommodate people up to 6′ tall (183cm), and many will still accommodate users up to 6’3″ (190cm), however, above this height it can be tricky to find the right equipment to suit you. This will force you to be hunched over, craning your neck, and probably causing more discomfort than while sitting. Here we identify the best tall standing desks and converters and give you a few extra tips and tricks to add those few extra inches to your workstation. After all our research, we really like the maximum height and versatility of the Fully Cooper Standing Desk converter. It offers a 22 inch (56 cm) maximum monitor platform height which is great for people above average height. It also maintains a high level of build quality and high-quality materials, crafted out of bamboo to create a visually stunning addition to your office. *This number has been edited. We originally had the maximum height as 50.5 inches, however, we forgot to include an additional 6″ is possible with a height extender. The average height of American men and women is 5’9″ (175 cm) and 5’3″ (161 cm) respectively, so it makes perfect sense that your average standing desk or standing desk converter is going to cater for these sizes. There are many amazing products out there, but the fact of the matter is many of them just don’t cut it for a taller person. The difference may only be a matter of inches, but in the end that will make all the difference between having a craned neck, sore back, and hunched shoulders, rather than your pain-free, upright posture. This problem is even greater if you are using a comfort mat beneath your feet, or have a treadmill desk set up; because these additions will put an extra few inches on your eye level. In this article, we include a couple of different styles of desk, so if you haven’t already done so, have a read of our Standing Desk Buying Guide. It goes into detail about different styles of standing desk, their unique features, and how to choose the right style for your needs. When it comes to finding these products, we research in-depth reviews and customer testimonials to give you the best overview possible of the tallest standing desk products. There are many other tall people like you who have been looking for solutions and have found the right product at the right height for them. Here we decided to not only look at traditional standing desks, but also added to the list standing desk converters, and mounted monitor stands, as these will become more useful the taller you are. The main criteria we looked at was height, however, we did not include an extremely tall desk if the other qualities were lacking. Therefore you can be sure that all of the following products are well-built, well-designed, and have other great features more than just their height. 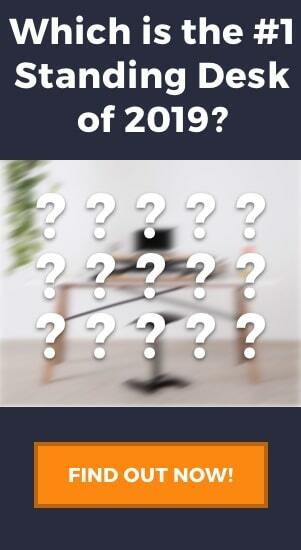 We also decided to include a range of prices in the final list, which offers you cheap tall standing desks on a budget, or the higher value range standing desks for people looking to invest a little more money into their office setup. 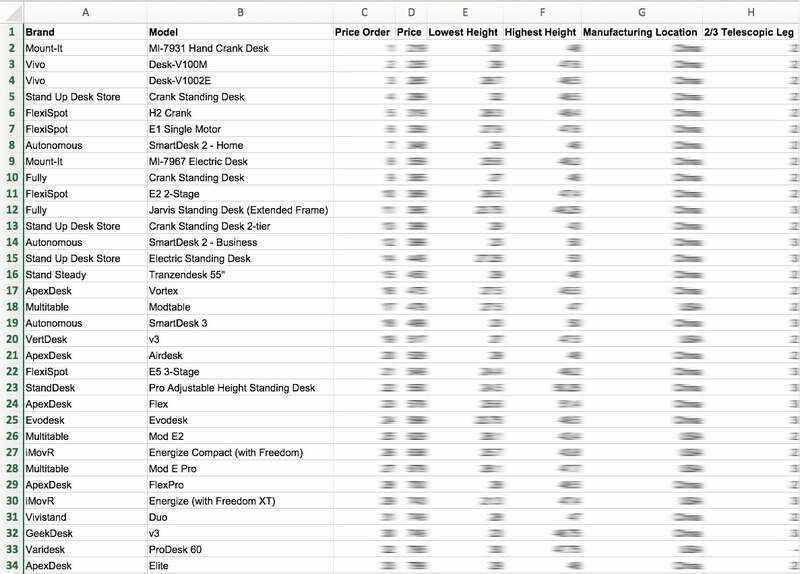 Ok, so despite the fact that this list is in no particular order, and every product has its pros and cons, there is a reason that the Fully Cooper Standing Desk Converter is the first. Aside from being a very aesthetically pleasing, beautifully designed piece of office furniture, it ticks a lot of the boxes required for a desk converter for a tall person. Not only that, the Fully Cooper is reasonably priced and offers a fairly simple solution to many people’s problems. Have a look at our full in-depth review of the Cooper to see what sets it apart from other standing desks. 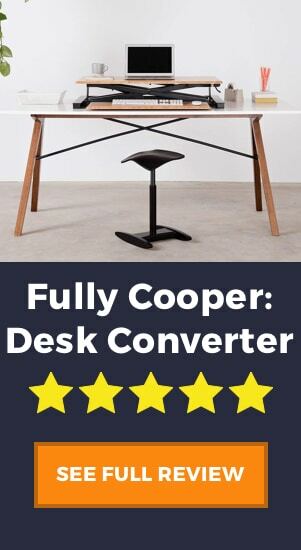 As we’ve already mentioned, the Fully Cooper is a great option for a standing desk. With its stylish build and ergonomic design, there are many reasons to consider it for your office. This one really speaks for itself! This article is looking for the most useful standing desk for tall people, so of course, we put the tallest desk converter first. At 22 inches tall, it really stands a good few inches above many other similar products, which range from 17 to 19 inches tall. In this list we also include the Ergotron WorkFit Dual, which is 22.8 inches tall (so, therefore, taller than the Fully Cooper), however, it is a completely different style of desk converter so we’d like to give it its own title. Given that the average office desk height is around 29-30 inches, the additional 22 brings your standing desk up to 51-52 inches, a great height for a taller person. Be aware, this height is measured from the top of the monitor stand, and not from the keyboard tray which sits a few inches lower. One thing that people like most about Fully products is their high-quality build and their use of bamboo for the desktops. Bamboo has become much more popular over recent years due to its sustainability and eco-friendly nature. Among other benefits, we believe the bamboo finish looks fantastic and gives the Cooper a modern finish that is very aesthetic and would blend in well with most office spaces. Another benefit of bamboo is the overall sturdiness and hardiness of the material. Many modern desks are built using wood chip or wood fiber boards, which although not a bad material, are more prone to chips and scratches which the bamboo board will be more resistant to. As with all standing desk converters, there comes the question, “how easy is it to lift?”. Fortunately, the Fully Cooper thought of this when they installed hydraulic lifting mechanisms to the x-frame of the desk, allowing you to adjust the level of force required to lift and put the desk down. If you are the type of person who is looking to change from seated so standing many times a day, then this is something you shouldn’t overlook. An electric lifting mechanism would obviously be the ideal solution, but the hydraulic assistance will save you when you want to lift the 35 lbs that the Cooper can handle. A core feature of the Cooper design is the working area. It boasts an impressive 732 square inches for the upper monitor surface and an additional 341 square inches on the keyboard tray. For most people, this large size is a necessity, especially with dual monitors, laptops and other requirements. The Cooper gives you all the space of a much larger desk, while still offering the more compact, versatile nature of a standing desk converter. If you’re a bit of a handyman or woman, then this one may not be such a big deal for you. But if you’re like us, and many other people, then this can be a lifesaver. In our opinion there is almost nothing worse than having to fully assemble a product after buying it, you don’t have the time, energy, and mainly patience to get it set up. Having the Cooper come built out of the box saves you all that wasted energy and you will be up and standing at your desk in no time. Having a large base is great for a number of reasons, it provides extra stability, reduces the amount of wobble in the desk, and allows you to put more weight on the desk surface. Unfortunately, the large base isn’t great for everyone. If you’re looking to buy a standing desk converter rather than a full standing desk, then maybe space is an issue for you. If this is the case, be aware that the floor space of the base of the Cooper is just over 3 feet wide and 2 feet deep, meaning you have to have a fairly big desk to go beneath it. This being said, because it is an x-frame converter, it will rise directly upwards (similar to how an ironing board will rise), unlike other converters out there which will rise away from the desk. We mention this time and time again here on Painless Movement, that having a fixed tray is not fully ergonomic for a standing desk. Look at our review of the Varidesk Pro Plus 36, or our Guide to Standing Desks, where we discuss this same issue. Having a fixed tray is overall not a deal breaker, but it does stop you having the ability to lift the monitor away from your hands, and it is possible that you won’t be in the ideal typing position. A great solution to this, however, and one that the manufacturers of the Fully Cooper also recommend, is to buy an additional monitor arm to your set up. Not only will this give you full ergonomic flexibility, it will even allow you to add extra inches to your final desk height, a great benefit for the super tall folks out there. Despite the aforementioned benefits of an x-frame structure, such as the vertical lift which is better in small spaces compared to z-frame converters, it also comes with some issues. An x-frame has many moving parts and places where is quite easy to pinch between the frame. It is possible to catch your fingers in the frame and also any loose wires that hang around your desk. Although the Cooper provides a cable hook to try to keep the wires away from moving parts, it is an issue worth noting. Although the Fully Cooper standing desk converter is the tallest converter on our list, it probably isn’t the best option if you are over 6’5″. Unless you have additional height under your base desk or use a monitor arm as we mentioned above, then the Fully Cooper might fall slightly below eye line for you. However, if you really like this desk, then take a look at the end of the article to see tips and tricks to give you more height on your current set up. The Lift Standing Conversion kit is the most simple, effective, and cheap product that we include in our line-up. If you’re not looking to spend much money and just want a quick and easy solution to have a tall standing desk, then this could be the product for you. This product is very different from others on the list, as it is not a standing desk converter or a regular standing desk in the traditional sense, but in fact is a kit comprised of separate products. First and foremost, the Lift Kit is an affordable product that is still a well made and sturdy build. Compared to the other products on this list, you will save yourself a pretty penny with this product. On top of that, one of the Lift Standing Kit’s best features is the separate monitor stand and keyboard tray. This will allow for maximum ergonomic adjustments, meaning your eye-line and your hand and wrist levels will always be optimum and you will avoid putting unwanted pressure on your wrists. To take this to the next level, you could also consider an ergonomic keyboard or an ergonomic mouse to make sure that you keep your wrists healthy. Speaking of mice, the keyboard tray also has room for a mouse so you will be able to use both in a standing position. Given that the products come in two separate pieces, there is no assembly required. In fact, the Lift Standing Conversion kit is among the easiest products for a standing desk to use, and you will be ready to work in no time. Its simple design means that it is very sturdy and will hold your monitors easily without any issue. The structure of the monitor stand is like a mini table with four legs, that can be lifted up and down and kept in place with a small notch and hole system. Our main issue with the Lift Standing Conversion Kit is that among all other products it is the most difficult to change from a sitting to standing position. In fact, this desk is really best suited to someone who is looking for a purely standing office desk, rather than the alternative sit to stand desk converter. Due to its design, once the conversion kit is adjusted to your preferred height, it is rather difficult to readjust when you have set up your monitors and computers. The safest way to do so, without damaging your things, is to remove the monitors and other valuable or fragile items before adjusting the desk. This, however, takes a lot of time, so if you think you’ll be moving from seated to standing regularly during the day, then this is a big factor you’ll have to consider. You may want to decide first if an electric or manual standing desk is more important to you, as this could influence greatly which product you decide to buy. The other issue is the aesthetic of the product. Now, for a standing desk obviously looks are one of the least important factors, however, if you are in any way design oriented and are trying to make your office beautiful as well as functional, then maybe the Lift Conversion Kit isn’t for you. The product does come in a variety of colors to hopefully suit most needs, however, in our opinion, it has a very basic design and simple form and is not exactly a design addition to your office. Based on all the above factors, we were able to give this product an 8.5/10. Despite its relatively boring appearance, the Lift Conversion Kit stands up well due to its sturdy build, height, and separate keyboard tray. This product is perfect for a taller person who is really looking for a pure standing desk, who puts function over form, and who doesn’t need to be changing from sitting to standing all day. 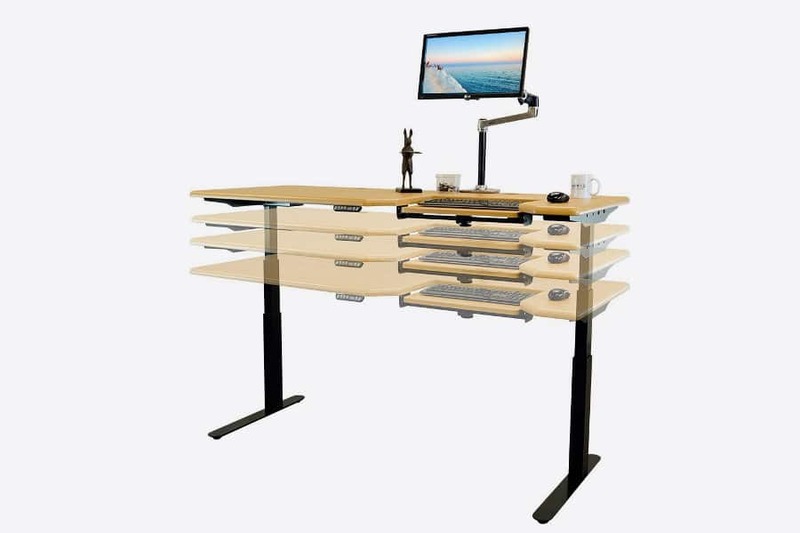 Additionally, its one of the best standing desks at this price level, offering a fantastic value for money option for your standing office desk. Here we have again another style of standing desk made by the brand ErgoTron. As the name describes, the ErgoTron is an ergonomic standing desk and one that will be even more useful the taller you are. Before we mentioned that the Cooper was the tallest x-frame converter in our list, however, the ErgoTron reaches up almost one inch higher, making it the tallest front clamp desk converter and the tallest altogether on this list. As we just mentioned, the ErgoTron is a front clamp standing desk converter. Unlike the previous two products which sit on top of your desk, the ErgoTron has a clamping system to lock it into place at the front of your desk. This strong clamp means that you can easily adjust where you place it along the length of your desk, and once in place, it is sturdy and stable. For this same reason, the ErgoTron can be mounted with two 22″ monitors, which gives you plenty of space for working. In front of the monitor arm is also a laptop try for those who still want to use their laptop screen. This amount of screen space should be more than enough for most people and, not only is there plenty of screen real estate, the maneuverability is fantastic. The screens are able to tilt, pan, and rotate, and will even rotate to a fully vertical position without interfering with the tray below. The last major benefit of the ErgoTron is the adjustability of the monitors and the keyboard tray. The LCD monitor arm and the tray have 18″ of vertical adjustability together, and then screens can be individually adjusted another 5″. 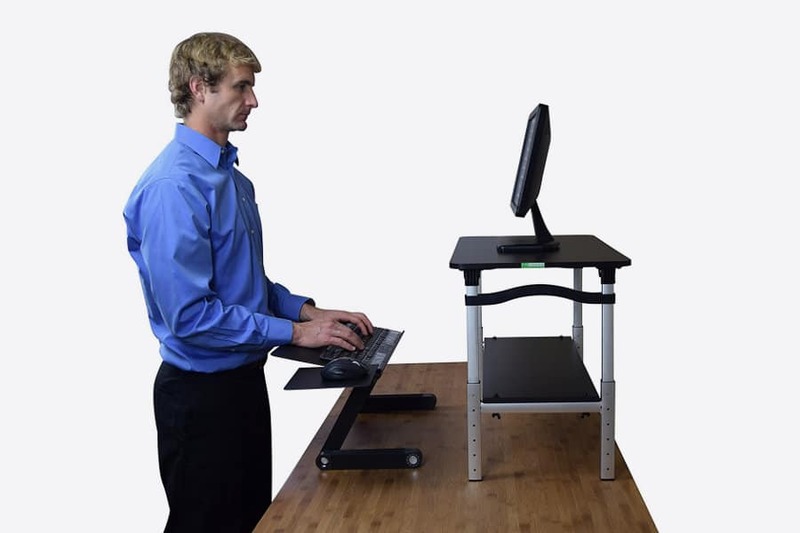 This is amazing for people looking for that extra ergonomic desk adjustment to make sure the hands and wrists are well placed relative to the eye level. In our eyes, these benefits alone make the ErgoTron Workfit Dual an amazing choice. If however you do not need two monitors, or won’t use a laptop tray, ErgoTron has you covered. The ErgoTron Workfit Sit-Stand Workstation is a slightly cheaper version of the product, without a laptop tray, and the ErgoTron Workfit Single has the laptop tray but only one monitor. The ErgoTron is a different type of standing computer desk converter, in that it is two monitor on a monitor arm, with a tray in front. This creates one of the first issues with the product, that you’ll need longer cables to connect from your computer to the monitors. This is an easy fix and you can easily pick up some long and cheap HDMI cables, however, it is somewhat annoying if you already have the hardware but just too short. The ErgoTron is a well-built, solid, and secure piece of equipment. If you mainly use your desk for the computer and don’t require a lot of extra space, then the ErgoTron could be the product for you. With an amazing 22.8″ monitor height and screen mobility, the ErgoTron is a great sit to stand computer desk for taller people. We love the fact that the keyboard tray and screens are also individually adjustable, a needed addition for a truly ergonomic computer desk. It is one of the more expensive products on the list, but you get what you pay for and therefore we give the ErgoTron a 9/10. To find out more, see our in-depth ErgoTron Workfit review where we take a closer look at all the pros and cons of this desk converter. The Stand Steady FlexPro Precision standing desk converter is one that sticks to the more traditional style of desk converter. What makes this one join the list is its 19.5 inch maximum height capacity, making it one of the tallest desk converters (aside from the Cooper). Always remember too, that with a desk converter you are also less limited by the standing desk, as you can easily raise the height of the underlying desk to suit your requirements. BONUS: If you order this product from Amazon they will throw in a FREE Standing Desk Wellness Guide. The Stand Steady desk converter receives some very high reviews, and it seems no surprise that it would feature on our list of best tall standing desks. Compared to other standing desk converters, and especially most full standing desks, the FlexPro Precision is actually on the cheaper side, despite boasting fantastic build quality and sturdy materials. The desk will arrive fully assembled, and at 50lbs, it is relatively transportable while still being heavy enough to reduce shakiness. The standing desk is also large enough to withstand comfortably 2 monitors and other books and work materials, and its spring-loaded lifting mechanism means you’ll have no trouble moving from a seated to standing position. Above all, the Stand Steady claims to accommodate users up to 6’4″ (193cm), and some users claim that this is conservative as the desk will be perfect for 6’6″ users. Take a look at the official Stand Steady product video, and you’ll see how truly high this thing can go! To start with, we should really say that it is not very often you find a product with so few cons and no negative reviews! In fact, the following issues that we will point out are very much nit-picking, and shouldn’t affect your final decision, but it is only fair that we address all issues of each product. Firstly, we were surprised by a relatively short warranty period of only 30 days. Unlike many products that will offer a longer, up to 2 years at times, warranty, the Stand Steady FlexPro’s cover will only last 30 days after purchase. 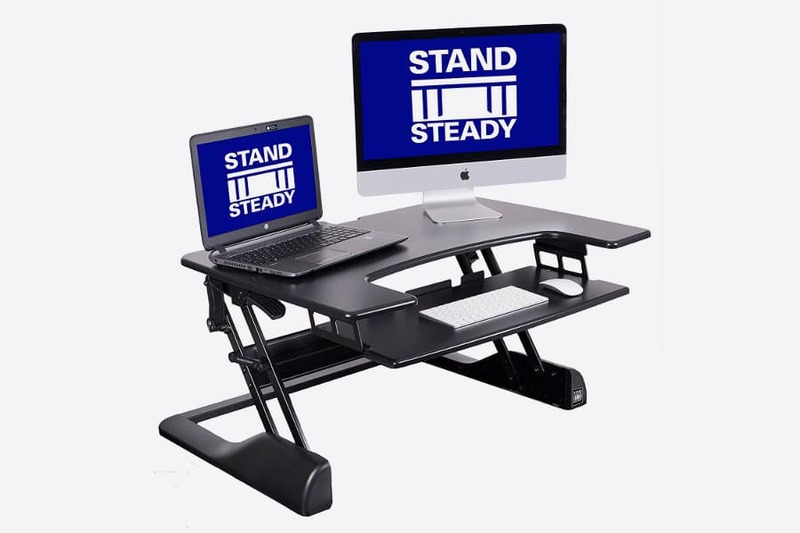 This being said, we have not found a single customer complaint regarding a faulty product, so maybe Stand Steady are just THAT confident in their standing desk converter. 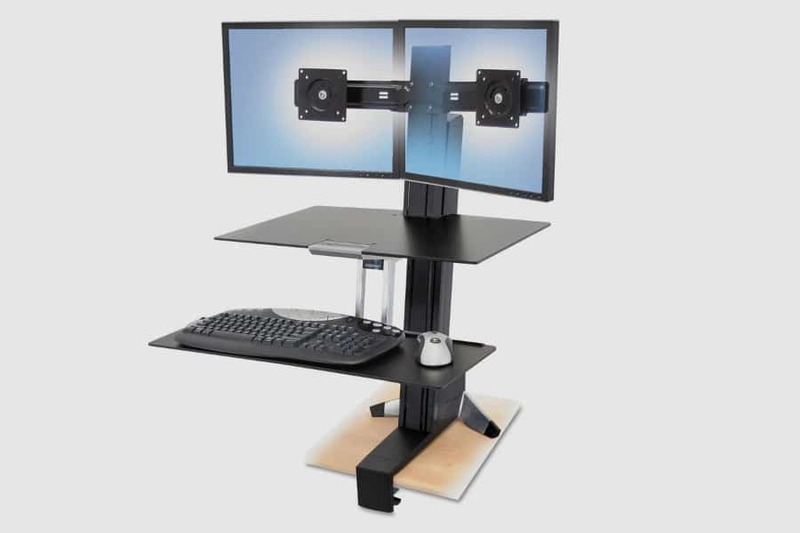 Another issue, which we address often among standing desk converters, is the lack of individual adjustability between keyboard tray and monitor platform. Again, the easiest workaround would be adding a couple of monitor arms for maximum adjustability. Lastly, the FlexPro Precision suffers the same issue as other z-frame standing desks. The frame, as it rises upwards, also will move out towards the user. If space is tight, then the FlexPro may cause you to be too confined within your office area. Well, the decision now becomes harder! We liked the Fully Cooper so much, but in fact, it has very strong competition with the Stand Steady FlexPro Precision. The only things separating these two products seem to be the height adjustment and the cost. The Cooper rises slightly higher than the Stand Steady, but the Stand Steady is slightly cheaper. So, if you’re not looking for THE tallest standing desk on the market, but you still want fantastic quality and function, then we believe this product is the right tall standing desk converter for you. The Jarvis Electric Desk is another wonderful product brought to you by the same makers of the Cooper Standing Desk Converter. It has the same build quality, use of strong materials, aesthetic design, and smooth functionality that people love about the Cooper. In fact, the Jarvis Electric desk has been rated consistently as the best standing desk by many different reviewers, including the Wirecutter by NY Times. At a fraction under 49 inches of frame, and including almost 2 inches of desktop, you have one of the tallest standing desks that on the market. Firstly, we must point out that this standing desk is BIG! Why is this a good thing you ask? Well, sometimes in the case of standing desks, size does matter. The additional size and weight will give you great stability and minimal shaking, and it will also have ample space for monitors, paperwork, books, you name it. Actually, the Jarvis boasts a HUGE 350 lbs lifting capacity (which we think you would struggle to reach). The Jarvis also is one of the first standing desks to incorporate a digital display with preset height levels. This means you’ll never have to fiddle around to find the perfect height that you had yesterday or the day before, you can now just directly program the desk to remember at what height you want it. This is fantastic for those who want to go from sitting to standing regularly, or especially if the desk is shared between a number of people in an office. Note that this functionality requires a power input, so you’ll have to set up your table next to a 120V outlet. The Jarvis standing desk also comes with a 7-year warranty on all parts. This is the longest warranty that we know of apart from the Omega Everest (that you can see below). Rest assured that this product is sturdy and will stand the test of time, and if you’re unfortunate enough that it doesn’t then you can get a full replacement within 7 years. Lastly, we love the fact the table width is adjustable. For a table this size, you could be limited to where you can put it, especially if you’re working in a small office. The Jarvis’ width can be adjusted from 42.5 – 74 inches, allowing you to squeeze it into smaller areas, or max it out for both a big and tall standing desk. If you’d like more detailed review on the Jarvis, you can see a full breakdown here. One thing you’ll find out when you begin using a standing desk, is that your cord management becomes much more important! The Jarvis standing desk offers some cord management for its own cables, but for additional cables, there isn’t anything to organize them. Ideally, you should buy your own power bank and some cable ties in order to connect the cables to the underside of the desk. This will keep everything organized, out of sight, and out of the way. The price of the Jarvis standing desk, when compared to other standing desks, is actually very reasonable, however, when compared to a standing desk converter it is a bit more expensive. We do recommend before buying a standing desk to read our standing desk buyer’s guide, which will help you determine what type of desk and what budget you need for that style of product. When it comes to a full-size tall standing desk, the Jarvis is a sound investment. It has many benefits and one of the things we love the most, programmable heights. This functionality can be a real time saver if you adjust the table a lot. Also, the table is so big that it can fit multiple monitors, keyboards, mouse, and paperwork easily. In fact, many people have two workstations on the same desk, that way you can have one side set up with your best chair for seated work, and the other set up with a treadmill underneath for active standing work. The possibilities with a large desk are endless. One thing we recommend however is to decide whether you need the bamboo tabletop from Fully. We love the style and design of Fully’s bamboo tabletops, however, it does come at a price. If you’re looking to save a bit of money, you can actually buy the frame directly from Amazon (which also saves shipping and handling fees), and then add your own desktop for example this one from IKEA. 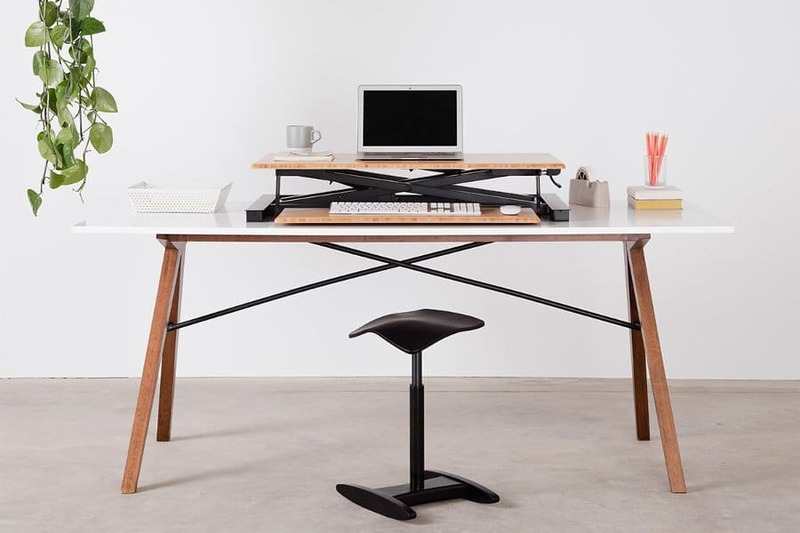 The Jarvis standing desk is available (frame and tabletop) on the Fully website. For just the frame, click on the link below. As the name might suggest, the Omega Everest is a mountain of a standing desk! It is truly the most spacious desk that would be adequate for even two people to work at the same time. In fact, an amazing feature of the desk is its customizability when you purchase it, that one can choose the overall size of the desk (the depth is a constant 30″ while the width can be from 48″ – 83″). Depending on the size you chose you then can choose where the keyboard tray will be, either center, right left, or dual (allowing two people to use the desk at once). The Everest does also come with a mountain of a price tag, but remember you are investing in your health and comfort at work, so given the quality of the Omega standing desk we believe it could be a worthwhile investment for you. The most notable feature is the SteadyType (patent pending technology) which is actually the keyboard tray for this desk. Unlike the Jarvis and most other standing desks, the Everest has an ergonomic keyboard that allows you to adjust the angle at which you type. Considering in our article on choosing the right standing desk we put a strong emphasis on the ergonomics of a standing desk, this feature stands out as a major benefit in our eyes. This addition will cut out the “anchoring stress” which occurs from placing too much weight on your wrists, so if you suffer from wrist pain such as carpal tunnel, then this may be your best solution. When you write an article about the best standing desks for a tall person, it makes sense to include THE BIGGEST standing desk on the market. As we mentioned before, at its largest the Omega will measure 83″ x 30″ x 54.5″ (with height extenders), making it more than suitable for any monitor setup. Not only that, it has a huge weight capacity of 265 lbs, smaller than the Jarvis, although still more than enough in our opinion. 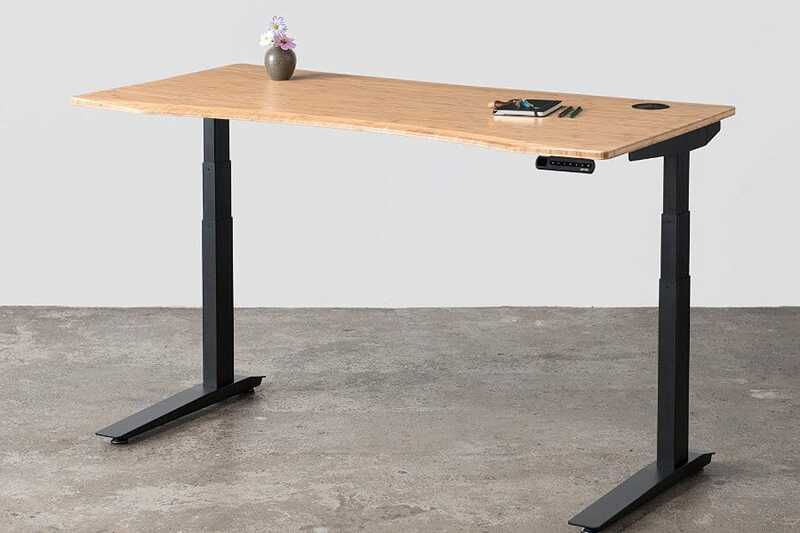 The warranty is where this desk really stands out from the competition, with its LIFETIME WARRANTY on the steel frame, 10-year warranty on moving parts, and 5-year warranty on tabletop and electronics. Like the Jarvis, the Omega is an electric desk. But don’t worry about the noise, as the motor is said to only generate a maximum of 46 dB when moving up and down, no louder than your office air-conditioning unit. Some people may be worried about disturbing the other people in the office, but this incredibly quiet motor makes sure that won’t happen. It also has a similar display and preset height feature, so you can always be at the same pre-programmed height when you need it. The major cause for consideration is the price of this standing desk. The smallest set up will cost over $1000, and the bigger and more customized versions are more and more expensive. As we mentioned though, it is a well-rounded product that really earns its price tag. You also must remember, you spend around 8 hours a day at your desk, it makes sense to make it as ergonomic and comfortable as possible, in the long run, your body will thank you. Another issue is the size. Just like the Jarvis, if you are limited for space, then maybe the Omega is not your best option and a smaller standing converter will suffice. If space is no issue though and you actually NEED a large working area, then the Omega really is the largest and tallest standing desk you will find. Some might say we left the best til last. If you can afford the desk, then we really think that this desk wins the competition of best tall standing desk, and what really sets it apart is the ergonomic keyboard tray. This is especially useful for treadmill desk users, who will naturally put more pressure on their hands and wrists while walking. What’s more, it has a fantastic warranty policy, which in our opinion shows the confidence that iMovr (the company behind the Everest Omega), has in their product. All in all, a pricey product, but definitely worth the money if you’re serious about your stand up work lifestyle and your health. Update, August 2018: the Omega Everest is no longer being produced by the manufacturer and is no longer available for purchase. The manufacturer has released a new product called the Lander which looks like a significant upgrade on the Everest. Stay tuned for a more in depth review and breakdown coming soon, or in the meantime take a look for yourself by clicking the link below. Choosing a desk is not easy, and if you are really struggling to choose between what are, in our opinion, the best tall standing desks, then we recommend having a look back at our standing desk buying guide. Other considerations for very tall people out there: unfortunately finding ergonomic furniture is not going to be easy for you. If you already own or are considering a purchase of one of the above products but you’re not sure it will cut it, then have a look at other products that will give you a little extra height, for example, desk leg risers. Additionally, and we say this for all users not just tall ones, to get full ergonomic benefit of your standing desk you should also look to buy some adjustable monitor arms. These will allow you to put your monitor even higher and in a much better position for your posture. As always, we hope you enjoyed this article and look forward to enjoying your new standing office!